Liberty Groundwork – the foundation for communication between you and your horse. A real partnership between humans and horses requires mutual respect and mutual trust – and a language that both understand. Every horse lover can create an invisible bond between themselves and the horse. But how can it be done? How do I get my horse’s attention? How do I get it to follow me? What can I do to make it stay by my side? Be natural! Act naturally and you will soon win gain your horse’s attention and trust. 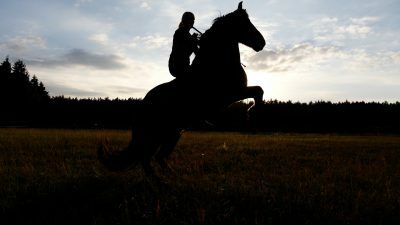 In the six chapters of this instruction video, horsemanship trainers Patricia von Schwedes and Imke Jürgensen show how liberty work creates a trusting relationship between humans and horses. Patricia von Schwedes and Imke Jürgensen – ways2liberty – teach liberty work all over Germany. The name says it all when Patricia and Imke let others benefit from their knowledge and ability during their workshops. Both care deeply about natural interaction with horses and about liberty groundwork. They believe these are the foundations for a spirit of cooperation between humans and horses – creating trust and respect using a language horses understand. 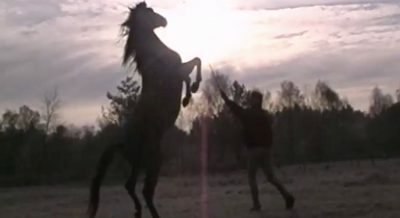 Created in cooperation with Schauwacker Filmproduktion, this video provides intuitive and inspiring instructions that enable any riding enthusiast to communicate with the horse without rope and halter in a way that the horse understands and thus achieve the greatest possible harmony with the horse. Using different types of horse and different breeds, Patricia and Imke demonstrate detailed, consecutive training sequences, which make liberty work a satisfying and enjoyable way of working with your horse. Trailer II in english! Es war sehr hilfreich!